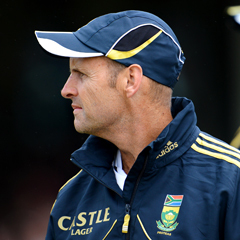 Johannesburg - It is never nice to lose but sometimes it is necessary to take a few steps backwards, in order to move forwards, said South Africa’s cricket coach Gary Kirsten. “We’re not proud of our performances especially as we were in winning situations in both games,” Kirsten said on Thursday. The Proteas take on New Zealand in the last of three one-day internationals (ODI) in Potchefstroom on Friday having already lost the series 2-0 to the visitors. In both of the previous games, the home side were unable to capitalise on their favourable situations. Chasing 209 for victory, New Zealand were in trouble at 141 for eight and yet went on to win the first game in Paarl, with 26-balls to spare. In the second ODI in Kimberley, the Proteas were cruising at 167 for one after 30 overs - needing another 113 runs - but lost their last five wickets for 41. Although their turnover in staff was not planned, Kirsten said the absence of some of the more senior players in the squad had afforded chances to the less experienced players which, in turn, helped to strengthen their reserves. “Our middle order has taken a serious blow, but in that lie opportunities for us to look at younger players,” he said. Kirsten said he was not only looking ahead to the 50-over Champions Trophy in England in June but needed to clarify his resources for the next ICC Cricket World Cup in 2015. “Life without Jacques Kallis is a big factor for us. He’s been two players in one and we’ve had that luxury for 18 years,” Kirsten said of the world’s top all-rounder. The decision to broaden their base of players was always going to be a risk but it was a necessity for their overall plans. “We didn’t take New Zealand for granted but we also needed to find a series where we could explore new talent and look to find the right balance. Kirsten had great faith in Faf du Plessis’ captaincy skills and said he had a lot to offer and possessed great leadership potential. “It’s important to keep building our leadership skills and find guys that can lead teams.